Wild and sour beers are not something you find a whole lot of here in Wisconsin. At MobCraft we are proud to have a Wild and Sour Program dedicated to exploring the unique flavor profiles wild and sour beers have to offer and present them to our customers with diligence and care. We launched our Wild & Sour beer program in Milwaukee, Wisconsin in 2016. Come experience wild, brett beers – fermented or conditioned with brettanomyces and tart, sour beers with lactobacillus and pediococcus. What are wild and sour beers? and what is the difference? Wild and Sour are two separate things that are often confused and typically misused as interchangeable beer descriptors. There are shared flavor profiles between both styles, but it is important to know their differences. Wild beers are fermented or conditioned with wild yeast called Brettanomyces or Brett for short. Now even though it is called wild yeast it is commonly acquired from yeast laboratories. However, you can gather it naturally from the air as is common in Europe. This is done through an open fermentation process where the beer is chilled in large open vats that allow airborne wild yeast to settle on the surface of the liquid as it cools. Then it is transferred into a closed fermentation vessel and allowed to ferment and mature until it is ready to serve. This yeast produces funky characteristics in the beer – some describe it as a stinky cheese flavor, horse blanket, barnyard funk, overripe fruit – you get the picture. Though those sound disgusting they actually are quite pleasant and sought after by many beer fanatics. Sour beers on the other hand get their tart acidic character from bacteria – lactobacillus and pediococcus are common types of souring bacteria that you will find in your sour beers. These bacteria are commonly found naturally on the skins of fruit as well as in your yogurt! They produce dried fruit aromas, acidic, candy-like flavors and aromas. Beers can have these bacteria contributing flavor during the fermentation process or while the beer is conditioning with fruit, and or in barrels etc. Let’s break it down a bit more. A common strain of wild yeast is called brettanomyces or brett – it can be found almost anywhere but most commonly around fruit producing trees and on the skin of fruits. It is best to purchase strains from yeast labs for consistency. Through an aging process brett can produce a TART flavor – NOT SOUR! If standard Ale is fermented with brett and not left to age many of these flavors will not come through but will produce a crisp dry beer. Sour beers have a pronounced sour character (go figure) ranging from mildly tart to mouth puckering sour – some develop almost vinegar like notes – they should not taste like straight vinegar though. Sour bacteria produce lactic acid which is where the sour flavors come from. Common souring bacteria are lactobacillus and pediococcus. IMPORTANT: Wild (yeast) beers can have souring bacteria in them, but that bacteria is not what creates the wild beer flavors. In the same way sour (bacteria) beers can have wild yeast in them but it is not what is contributing to the acidic character of the sour beers. Wild yeast and sour bacteria come together in some styles, such as spontaneous ales (lambics for example) or American mixed-culture beers (a blended culture of different wild yeast strains and different souring bacterias). These beer styles are full of brettanomyces and souring bacteria. 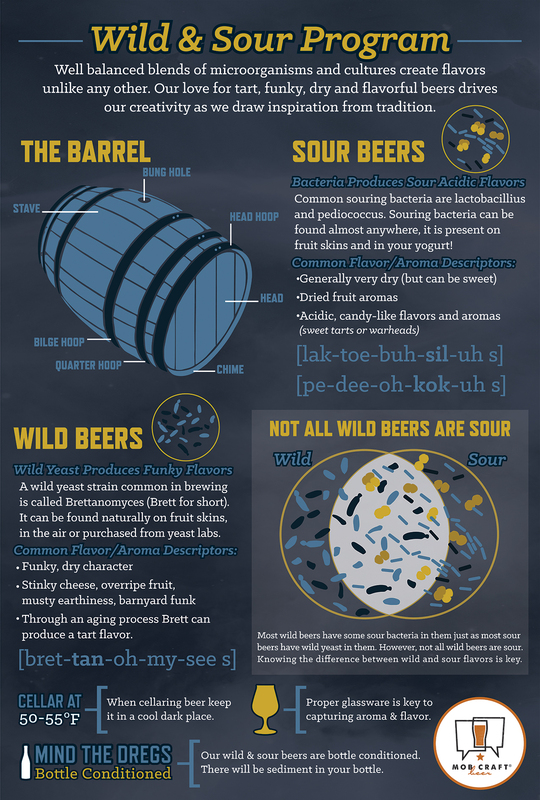 Check out our informative wild and sour beer poster!